Here is a little 4-part model that someone taught me back in the late 1970s. So if experts – whom we work with – can themselves be at any one stage for any one aspect of their jobs – just as our Learners may be at any one stage for any one aspect of their jobs – or at multiple stages within any one aspect of their job (another way to segment the target audience) – we need to understand what the implications are for our developers “who Develop our content” … or our Curators of Content … and their strategies and tactics … our overall methods. Think about ADDIE. Someone can be more experienced in Design than Analysis and be more familiar with Design in some modes/media than others. But in Design of Group Paced Workshops she rocks. E-Learning, not so much. But if you need a MP for Design of Group Paced Workshops – and other modes/media, you’d probably want to include her in a mixed group for an Analysis Team – should you need one. Unconsciously Incompetent – is when you don’t know what you don’t know and you don’t know what you need to know. Informal or Discovery Learning approaches here are terrible for the Learner. It’s also known as Sink or Swim. And only the strong survive. An expert at this point is no expert. Consciously Incompetent – is when you now know what you don’t know. The Learner is better prepared to learn. The expert is still not an expert at this point. Consciously Competent – is when you know what you need to know – and know what you don’t need to know. The learner now knows. And is gaining expertise to some level, over time. And can be tapped as an SME or Master Performer – and will probably miss a lot less than the 70% that a longer-time Master Performer/ SMEs might miss – having been operating on automatic pilot longer. This is the best time to work with a person IMO. Best, but not perfect. Unconsciously Competent – is when you don’t know consciously what you know anymore. You are on auto-pilot on the familiar things, the mundane (to you) things. It’s easy to assume incorrectly what the target audience already knows and does not. 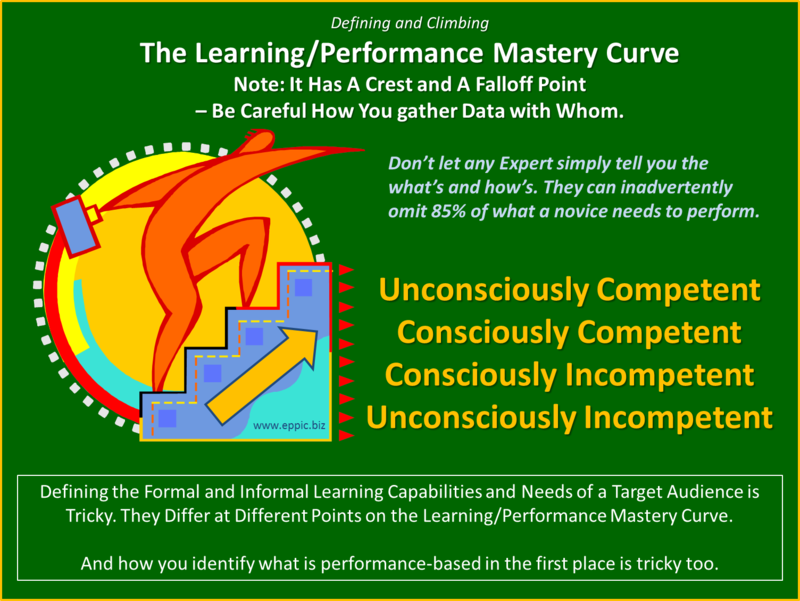 This is where most experts can miss up to 70% of what a novice needs to perform. Not a good idea to simply trust what they tell you. They can’t help it. I’ve been dealing with this issue – experts not being able to be expert enough for my needs – by using teams of Master Performers. And getting their ideas and thoughts on what they do and how they do them – on flip chart pages – visible – right in front of them – and where they can articulate that AND see what got captured AND then massage it as necessary (this is where the GREAT STUFF COMES OUT – BTW) AND then identify “the gaps” of the other performers, the non-Master Performers and for the other non-People variables – what they are and what causes them – their thoughts on that anyway. Again – that does not make them right – just because a group can be brought to consensus. But a consensus from a mixed group of Master Performers (MPs) is much more trustworthy in my experience than going forward one person’s opinion – or a series of one person’s opinions. For me – if a group of Clients and other Key Stakeholders – comes to a consensus on who the Master Performers are, and who any other relevant SMEs might be – that are indeed critical to providing inputs to the definitions of Ideal Performance and the Current State Gaps – and then the enabling Knowledge/Skills – that are all part of my PACT and EPPI approaches. Your approaches may vary as necessary. I co-authored an article on this approach applied to Curriculum Architectures – in TRAINING MAGAZINE back in September 1984. Still works today – for Curriculum Architecture Designs of T&D Paths – and for ADDIE-like development efforts for performance-based Instruction and Information. And I also co-authored an article on this on the prior efforts of Design … Analysis that same year in November for ISPI (which was NSPI back then in 1984). Great insight and I admire your experience bringing this simple but little ignored model back to life. Coincidentally, I published an article on same topic a while ago. Have a look if you get some time. “Developing Skill Acquisition Training Based on Unconscious Competence Theory” at http://personal-resonance.com/guidelines-5-models-skill-acquisition-based-unconscious-competence-theory/. I appreciate your sharing of some wonderful articles. I would like to link those back to my blog, especially those written on mastery curve. Great thoughts.